Sometimes, two nights just isn't enough. With wonderful weather and abundant activities year-round, guests are invited to take advantage of the low, off-season rates for a longer stay. Moonstone Beach is characteristically Cambria, any time of year. With wonderful weather and abundant activities year-round, guests are invited to take advantage of the low, off-season rates for a longer stay. Whether travelers are headed to Cambria for a long weekend or taking off for a midweek adventure, an extended stay on the Central Coast allows for more time to see it all—or rest and relax to the max. With wonderful weather and abundant activities year-round, guests are invited to take advantage of the low, off-season rates for a longer stay. Visitors can download the Visit Cambria app, available on both iOS and Android, and select the activities that will create their perfect getaway. Then they are invited to explore, rejuvenate, and enjoy everything Cambria has to offer. Take time to refresh yourself on a vacation in Cambria by taking a calming stroll on the boardwalk, getting a massage, doing some yoga—or maybe all three. No trip to Cambria would be complete without a stroll on the Moonstone Beach Boardwalk. Listen to the calming waves while walking alongside the ocean, or head down to the beach to hunt for moonstones. With Tula Yoga, guests can do yoga in the studio in Cambria’s West Village or on the beach. Guests can reset their intentions and let their minds be at peace while stretching. Located at the Cambria Pines Lodge, the healing hands at Sojourn Spa are experts at designing treatments to fit each individual customer. Step into a world of relaxation and leave completely refreshed and renewed. If the great outdoors are calling, Cambria has the answer. From Fiscalini Ranch to an abundance of natural wonders, adventure awaits. As the main trail through Fiscalini Ranch, the Marine Terrace Trail ventures through the forests of Monterey pines and out near the cliffs alongside the ocean, offering stunning vistas and an up-close look at local flora and fauna. Thousands of elephant seals visit this rookery each year to breed, give birth, molt and rest. 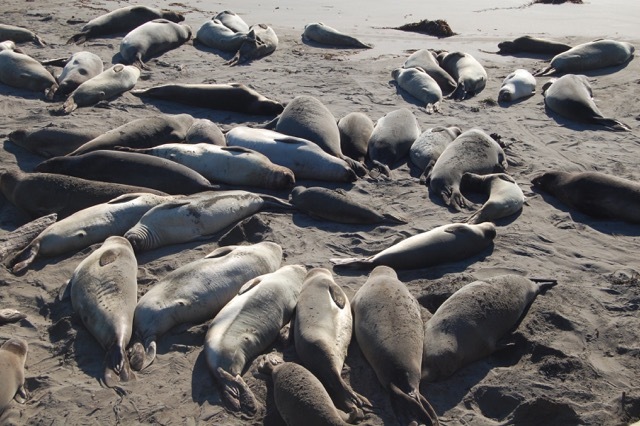 Located on Highway 1 seven miles north of San Simeon, visitors can see the animals that migrated thousands of miles to stop on the Central Coast. 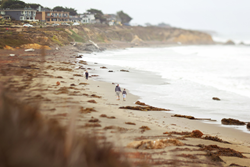 As visitors explore Cambria, they can become stewards of the community by participating in bite-sized activities that help the area. Clean up litter on Moonstone Beach, learn about the environment at Fiscalini Ranch, or visit tidepool communities at the Coastal Discovery Center. Guests will get more out of their getaway when they give back. Get to know a different side of Cambria by exploring the mysterious, historic buildings in the area. This area is full of amazing stories for those who are willing to seek them out. 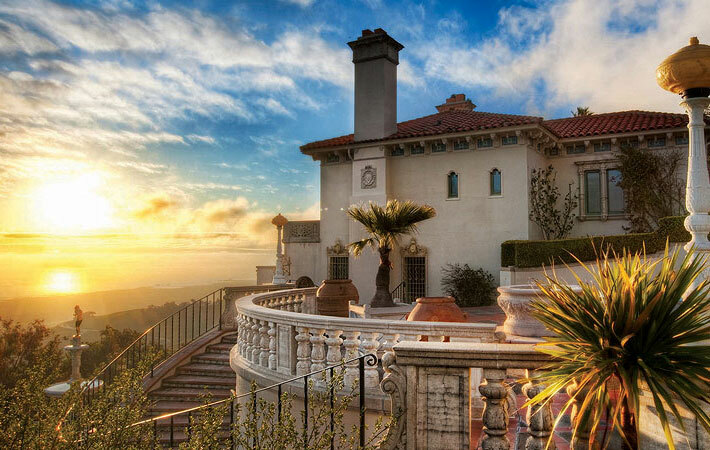 Built in the 1920s by media magnate William Randolph Hearst, ‘La Cuesta Encantada,’ or the Enchanted Hill, is a must-see for any visitors to the Central Coast. Only six miles north of Cambria, the grand estate features 165 rooms and more than 125 acres of sprawling gardens, walkways, terraces, and pools, most of which are available for tours. While driving north, keep an eye out for the famous zebras that call Hearst Castle home. The historic architectural gems that are peppered around town date back to the 1800s, when Cambria was a bustling mining town. Since then, Cambria has gone through many transformations to become the hidden coastal getaway it is today. Guests can use the Historical Tour on the Visit Cambria app to guide themselves to each building or stop by the Cambria Historical Museum to pick up a guidebook. Fifteen miles north of Cambria, on a rugged, windswept coastal point rests the historic Piedras Blancas Lighthouse. This structure was first illuminated in 1875 to guide mariners along the California coast, but is now only accessible via guided tour. A variety of tours are available year-round, including whale-watching tours, building tours, and sunset tours. Established in 1870, this creamery and avocado farm offers tours to the public that will take visitors through the cheese making process. Visitors will also be introduced to their adorable herd of La Mancha goats. Cambria is known for its abundance of culture. With no chains in sight, every storefront, lodging property, and restaurant in Cambria is completely unique. That kind of culture must be experienced to be understood. Check out the Art Tour in the Tours section of the Visit Cambria app for an introduction to the many incredible galleries in town. Each has something special to offer. There are tasting rooms all over Cambria, each offering a different specialty. Stolo Family Vineyards, one of the local estate vineyards, has a beautiful property just outside of town with award-winning varietals. Cutruzzola Vineyards, the other estate winery, has a tasting room full of experts on coastal blends. Cayucos Cellars, Moonstone Cellars, Black Hand Cellars, and Twin Coyotes Vineyards are full of delicious reds and whites that will appease any wine lover. The shops in Cambria offer everything from souvenirs to keepsakes. Because every store is completely unique, shoppers will want to take their time strolling through the East and West Villages and finding their perfect memento.